With an over 35 years’ experience in thermoforming and cutting plastic materials and related products, Sarong is now a reference company in the sector. We are able to realize highly adaptable products, meeting the needs of different sectors, from pharmaceutical, to chemical, to food industry, ensuring the highest quality standards, hygiene and control. The "food- packaging" can be considered a system of three: " Food - Packaging - Environment ". At the center of this chain there is Sarong, able to produce a special self-protected capsule that ensures your coffee quality, providing a customized product, tailored on your needs, with the chance of changing the thickness of the material at every point of the capsule. 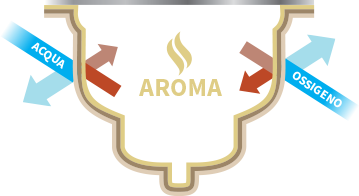 This particular process ensures the perfect maintenance of the aroma and the taste of your coffee, until the expiry date. A proper processing of selected materials ensures to packaging the ability to limit the harmful interactions between the external environment and the content within our capsules barrier. Basically, this turns in limiting the passage of gases, vapors and of ultraviolet light from outside to inside of the capsule and to make sure that this limitation will last for a long time. The film has high barrier properties both to oxygen and to water vapour, thanks to the layer of EVOH, thereby ensuring excellent protection and preservation of the product. The high thermal resistance of the PP structural layers also enables the use of packaging even in high temperature conditions, such as that typical one of the machines for the production of espresso coffee. Possibility to choose the thickness of the materials up to 1200 μm. Material characterized by high oxygen barrier layer of EVOH. The combined characteristics of the structural layer in PS and PE sealing layer also make it particularly easy to work. It is less heat-resisting than the PP-based structure; it is suitable for the production of capsules used on machines, working at moderately elevated temperatures (American coffee) but not for espresso coffee capsules. Possibility to choose the thickness of the materials up to 1200 microns. Great structure for the top lid sealing of capsules in PP / EVOH / PP, characterized by perfect impermeability, high heat-resistance and ease of perforation. Possibility of 6 colors printing. Economic structure particularly suitable for many applications. The sealing layer is suitable for both structures in PP and structures with PE sealing layer. It is characterized by a perfect water-resistance and particularly high ease of perforation. Possibility of printing up to 6 colors. Sarong has been working for many years in the field of special thermoformed packaging. Thanks to this know-how, we can provide a valuable help in the choice of better materials’ structures. If despite special needs arise, the well-established relationship with the main manufacturers allows us a preferential path in the development of customized structures. Such as for our capsule for American coffee, already existing on the U.S. market, you can recycle all the materials separately, simply "peeling" the aluminum layer coverage and the filter containing the coffee. You can seal or apply internal filters of different nature, such as paper or plastic, with the option to make it even peelable. The two equipped laboratories , the certification of the quality system, many years of experience in the pharmaceutical field are guarantees of the highest quality. Our machines are equipped with sophisticated controls, able to guarantee an accuracy of a tenth of a millimeter as regards the thickness, and even of 2 hundredths of a millimeter as regards the cutting. The thermoforming allows the processing of various plastic materials, including the "barrier" materials, allowing single doses to be sealed on top with cover materials such as aluminum and polypropylene and others, in one or more layers. With the self-protected capsule, you can reduce the volumes of packaging and storage by a third, in addition to saving the space on shelves and in warehouses. Sarong provides to its customers the support of its internal department of research and development and of the technical office for the study and design of new products, with possibility of patenting each different project. Our materials in PP / EVOH / PP are completely recyclable and recoverable, providing our customers with the chance of separating the different products (aluminum, plastic, coffee).